Civilization has marched beyond the thinkable, but getting right down to it, we see that essentials have remained much the same. Establishing vineyards follows the same logic as that of settlements, millennia ago, around the Nile, Tigris, Euphrates, and Ganges. These provided plentiful flowing water and fertile soil. Grapes may demand different elements but, as in the earlier settlements, they are geographical. The State of California was already settled by the time many vintner-explorers headed to the West Coast seeking perfect weather and soil. 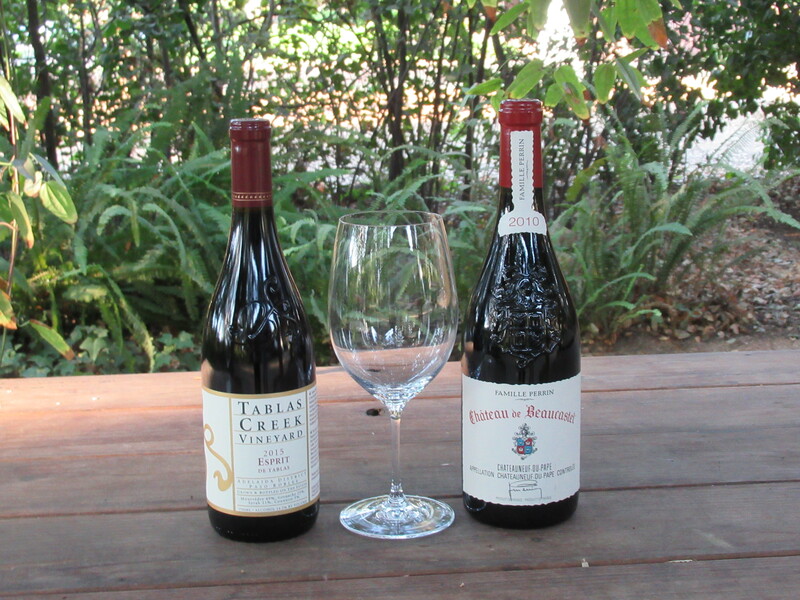 That was certainly part of the quest when Robert Haas, founder of Tablas Creek Vineyard and his collaborator, Jacques Perrin of Chateau de Beaucastel, found themselves on the Central Coast of California. Chateau de Beaucastel, in Chateauneuf de Pape in the Southern Rhône, dates back to the mid-sixteenth century. In the very early twentieth century, the wine estate was transferred to Pierre Perrin. This family continues to own and manage the estate. As I write these stories I’m struck by the common thread of Chance that runs through them. Although none of it would have meant anything without grueling work, risk taking, and analytical abilities, it is a fun exercise to think, well, what if he’d met someone else? What would he have created then? Sort of like, if the apple hadn’t fallen on Newton’s head. You catch my drift. The what-ifs that writers ponder are no exercise in futility. In early 1970s, after setting up Vineyard Brands, his wine-import company, Robert was traveling through Napa with Jacques. 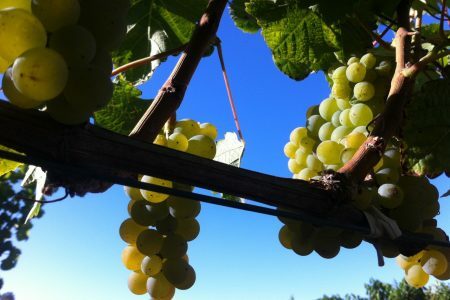 The latter expressed surprise that no Rhône wine grapes were growing in a perfect Mediterranean climate, Robert writes in his blog post from August 18, 2011. They were looking for three things – a Mediterranean climate, enough rainfall to not require regular watering, and calcareous soil. They came upon them all in their current location and in 1989 they closed the deal on 120 acres of land. Tablas Creek was now theirs to invent. The climate didn’t map exactly to South Rhône. The summers are hotter, the winters colder in Paso. Where it rains in the summer in that part of France, Paso receives all its rainfall in the winter. As for the soil, the Haas-Perrin team struck the rare calcium carbonate in California. This soil allows the roots of the grapevines to go deep in search of water and nutrients, resulting in the high quality of berries that give Rhône wines their distinctive flavors. The day after speaking to Jason, I visited his winery. I had, of course, read about their biodynamic farming methods and the principle of not burdening the planet with tons of waste. But I was not prepared, on that hot Labor Day weekend, to be greeted by a tub of steel bottles with ice-cold water at the entrance to the tasting room. We were invited to take one (and return it, of course) as we toured the facilities. 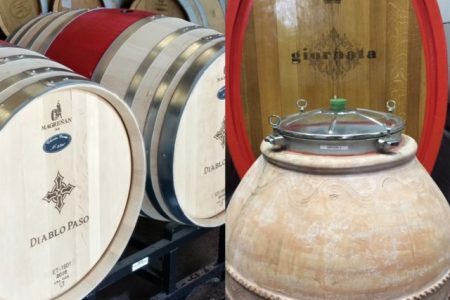 The grapevines in large pots on the patio (main picture) tell the story of the journey of Rhône vines from Southern France to California. Ungrafted, they arrived in Paso after spending three years in upstate New York in quarantine. Then, explains Jason, they took cuttings from these to graft and plant in the vineyards and to supply to those who wanted to grow their own. This picture of the sprawling plant is a rootstock vine, native to North America that offers resistance to phylloxera, a root louse, which decimated entire vineyards in the late nineteenth and early twentieth centuries, both in Europe and in the U.S. It is grafted on to wine grape vines (vinifera) that lack such resistance. Our guide, Gustavo Prieto, showed us the machine that grafts the vinifera with rootstock vines. The result was a stick, completely underwhelming, that clearly showed where one had been attached to the other. I was hard pressed to understand how such a dry little stick could produce anything, much less juicy grapes! 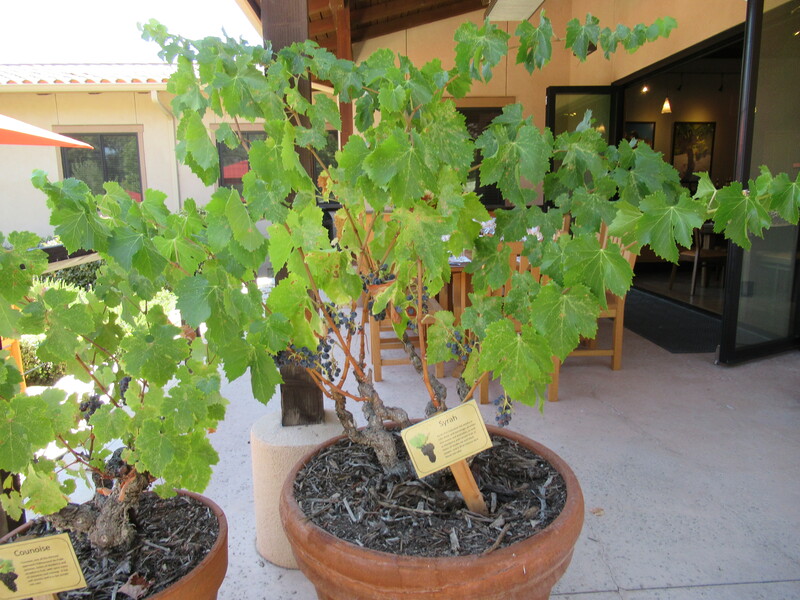 But with tons of nurturing, they grow roots and are put in the soil to produce healthy vines and delicious grapes. And so it marches on. The decision by the Haas-Perrin team to not keep the vines proprietary has been a boon for the movement. As I mentioned in my last post, most Paso wineries now grow a Rhône varietal. 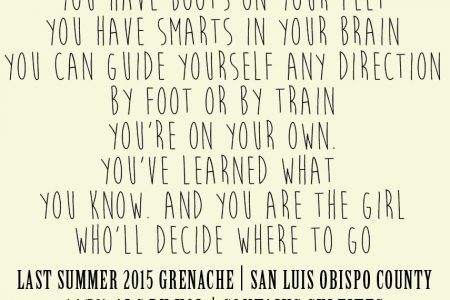 The Rhône varietals don’t stop in the Central Coast. All up and down the West Coast, as well as in parts of the East Coast, these grapes are creating their own brand of American Rhône. And while much of the activity had started decades earlier, the establishment of Tablas Creek gave it a definition.